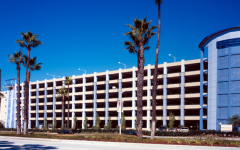 The Pike Parking Structure is part of an exciting retail/entertainment center between the Long Beach Convention Center and the Aquarium of the Pacific. 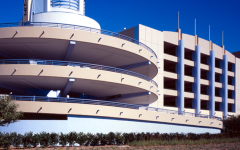 The first view of the amusement park themed complex is the spiral ramp at the west end of the parking structure, with its elaborate streamlined moderne tower, highlighted by neon spotlights. 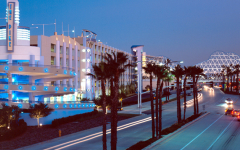 At the east end of the parking structure, a massive tower with six elevators also evokes the streamlined moderne style, crowned with a 32’ sunburst, patterned on the light fixtures that once lined the “Walk of a Thousand Lights” at the original Pike Amusement Park. Between these two unique features, the seven-level, 2211-space structure is highlighted by curved metal screens, trellises with climbing vines, and semicircular metal column covers. 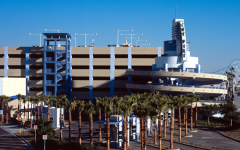 To avoid lines, users will find 10 entry and exit lanes, and traffic within the structure is expedited by the double-helix parking ramp and circular ramp exit.